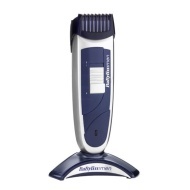 alaTest ha raccolto ed analizzato 50 recensioni su Babyliss 7845U I-TRIM Stubble. La media della valutazione per questo prodotto è 4.5/5, confrontata con la media della valutazione di 4.3/5 per altri prodotti. Abbiamo analizzato differenti valutazioni di esperti ed utenti, età del prodotto ed altri elementi. A confronto con altri prodotti, Babyliss 7845U I-TRIM Stubble ha ottenuto un alaScore™ complessivo di 82/100 = qualità Molto buono. Good and efficient product for its price, though I haven't used it for long. It doesn't sit on its base properly is the only problem. Exellent little whiskers tool best one I have ever had,versitile easy to use and strong enough for any beard. And the price was realy good too,much better than pricier trimmers. Product does what it it is designed to do perfectly for me (i don't have the worlds thickest stubble!). I bought this for my husband as a gift for christmas and he was totally thrilled with it. I was lucky to reserve this as it was sold out in other shops. Fantastic price and was in and out of the shop in no time.